On Saturday February 3rd 2018, The Jackson Township First Aid Squad held their annual Installation of Officers Dinner at the Hilton Garden Inn in Hamilton, NJ. In attendance were representatives from multiple agencies, life members of the Squad and Current Squad members with their invited guests. Township Councilman Scott Martin swore in the 2018 Officers: Al Couceiro, Chief, Steven Porth, First Lieutenant, Kevin Bender, Second Lieutenant, Nick Schulman, First Sergeant, Daniel Vanderclute, Second Sergeant, Debbie Amato, President, Stephanie Havens, Vice President, Debbie Visconi, Recording Secretary, Diane Stanaway, Corresponding Secretary, Nicole Couceiro, Treasurer, Elizabeth Saar, Trustee and Matt Scatigna, Trustee. During his speech, Chief Al Couceiro congratulated the Squad as 2018 is their 65th year serving the residents of Jackson Township. He also highlighted some significant moments for the past year. In 2017, for the first time in over 35 years the Squad was able to purchase their own ambulance without any assistance from the Township Council, they also purchased a Supervisor vehicle with a plow, and most importantly, the Squad is now 95% self-sufficient. The Squad is now capable of funding the cost of fuel, vehicle maintenance, insurance, training, uniforms and equipment. One of the most significant things we did this year was introduced our new identity “Jackson Township Emergency Medical Services”. Chief Al Couceiro also applauded the efforts of the membership by answering over two thousand calls for the year 2017 and maintaining a nine-minute average response time. He also encouraged the members to take a minute tonight and speak with the life members present, listen to their stories, they were once us, because remember this “We don’t know where we are going unless we know where we came from”. Amongst the many awards presented Patrick Handel received the Desirae Patricia Ferry Award for being 2017’s “Top Call Runner” by answering 238 calls for service. Nicole Couceiro was present the 2017 President’s Award. Stephanie Havens was presented the 2017 Chief’s Award while EMT’s Patrick Handel and Alexsandra Taylor were awarded the Jack Johnson Award. Jackson First Aid ambulances will now be equipped with continuous positive airway pressure (CPAP) masks, which will allow EMTs to better treat patients with serious respiratory and cardiac ailments. CPAP, which provides positive pressure during respiration, allows the Squad to provide more effective treatment for congestive heart failure, and will improve patient outcomes. ​On January 30, 2016 members and guests of the Jackson Township First Aid Squad began their 62nd year in service with their annual installation of officers and awards dinner. The Jackson Township First Aid Squad has been awarded $117,605 in competitive Federal grant money under the 2014 Assistance to Firefighters Grant (AFG) Program to purchase new protective equipment for its members. The Jackson Township First Aid Squad has provided volunteer ambulance service to Jackson Township for over sixty years. Formed in 1953, the Squad has almost 100 members, and annually answers over 2,000 calls for service during operating hours of 6pm to 5am, transporting more than 1,000 patients to area hospitals each year. The Squad will use the AFG funds to purchase protective items such as helmets, goggles, protective coats, and safety boots for its members. Every year, the Squad responds to hundreds of car accidents and other dangerous events, both in Jackson and the surrounding towns. The new equipment will help the volunteer first responders remain safe while providing service to their community, protecting against cuts, broken glass, and spilled blood and fluids. The AFG grant provides 90% of the funding for the purchase, with the other 10% coming from Squad funds. 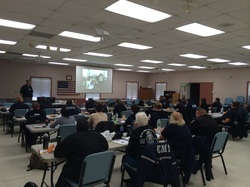 The AFG program, administered by the Federal Emergency Management Agency (FEMA), helps fire departments and emergency medical service organizations obtain the equipment they need to do their jobs effectively, including protective gear, emergency vehicles, training, and other resources that help protect the public and emergency personnel from fire and other related hazards. The Jackson Township First Aid Squad answered 178 calls and served almost 2000 hours (1978, but who's counting?) of regular duty time during May. But we don't just answer ambulance calls. Here are a few other things that Squad members have been up to during the month. The Jackson Township First Aid Squad responded to a serious single-car motor vehicle accident on Toms River Road near Savannah Road on March 13 at approximately 10:20 pm. One patient was extricated from his vehicle and transported to St. Vladimir's Church, where he was transferred to the New Jersey State Police SouthStar helicopter and taken to Capital Health Regional Medical Center (Helene Fuld) in Trenton. The Jackson Township First Aid Squad recorded its first CPR "save" of 2014 on March 9, when they responded, along with Jackson Township Police and MONOC Paramedics, to a residence in the area of Stump Tavern Road. 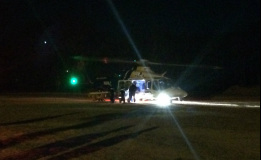 The Squad was dispatched at approximately 12:50 am, and arrived to find the patient lying in a hallway in cardiac arrest. CPR was initiated by the crew, and when paramedics arrived the patient was given numerous medications in an attempt to restore her heart rhythm. Her pulse returned and she was transported to Community Medical Center, where she remained in critical but stable condition in the Intensive Care Unit as of Monday morning. According to the American Heart Association, 383,000 out-of-hospital sudden cardiac arrests occur annually, and 88 percent of cardiac arrests occur at home. Less than eight percent of those who suffer cardiac arrest outside of the hospital survive. The prompt action of the Squad members has given their patient a chance to beat these odds. 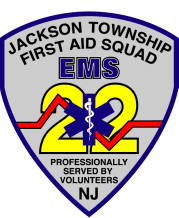 The Jackson Township First Aid Squad is an all-volunteer, donation funded emergency medical services organization that provides ambulance service to the Township of Jackson, New Jersey between the hours of 6 pm and 5 am every day of the year. If you are interested in learning CPR and other medical skills, please consider joining us, or making a donation.